Does morphine make chronic nerve pain worse? When a person takes a painkiller, the assumption is that the pain will decrease in intensity. This is particularly true when the medicine taken is morphine. 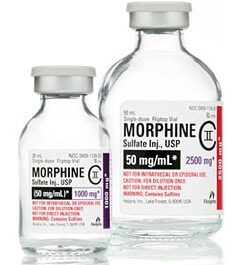 However, a recent study indicates that morphine may actually make chronic nerve pain worse. Why might this be the case? According to Dr. Peter Grace, an Australian neuroscientist at the University of Colorado and co-author of the study, “It seems morphine works quite well initially, but as the immune system ramps up, this starts to oppose the pain-relieving properties of morphine and morphine starts to induce pain in its own right.” Click here to read more. This entry was posted in Article, News, Pain Management, Research and tagged morphine, pain, research. Bookmark the permalink.